"A communist society will be organzied by the principle: from each according to his ability, to each according to his need" "Marx, chain smoking is NOT an ability" "Oh yeah? Then I'd like to see you try it"
The writing of the Communist Manifesto isn't too far off this. After being tasked with writing it, Marx procrastinated, dragged his feet, and even worked on other stuff as the deadline approached. In his personal life, Marx was known for chain smoking, heavy drinking, and generally not a very healthy lifestyle. He would do things like go on pub crawls, where he drank one beer at each pub on a certain street, and then threw rocks at the lamp posts at the end of the street. I guess there were like 15 pubs, so yeah, he was a bit of a drinker. 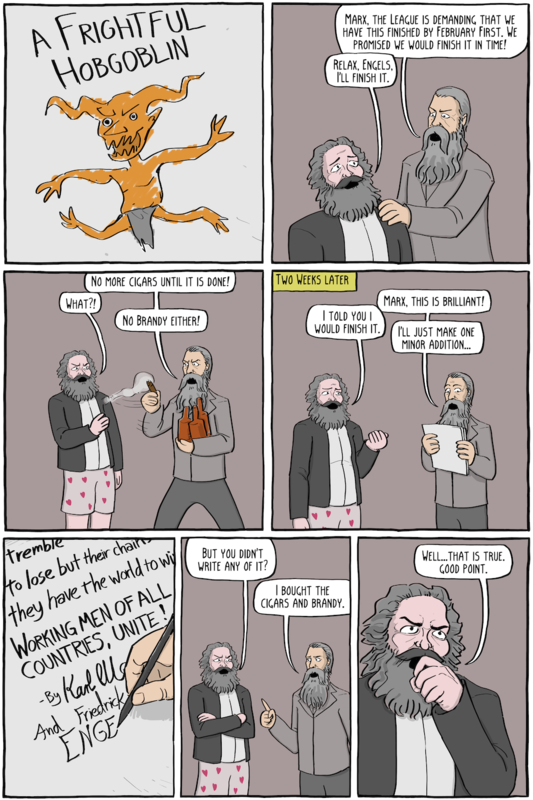 The final draft of the manifesto was written entirely by Marx, despite Engels being given a coauthor credit. 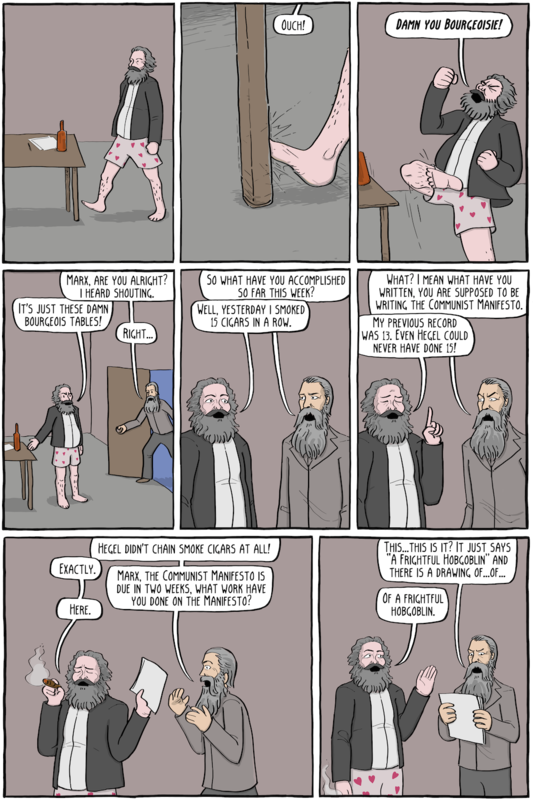 By Engel's own admission, pretty much all of the ideas came from Marx as well, so it isn't super clear what he did aside from buy the drinks. "A Frightful Hobgoblin" was the original English translation of "A Spectre" of the iconic opening line (A spectre is haunting Europe - the spectre of communism). So Marx didn't actually write that in German (he used the German word Gespenst, which is closer to Spectre or Ghost).